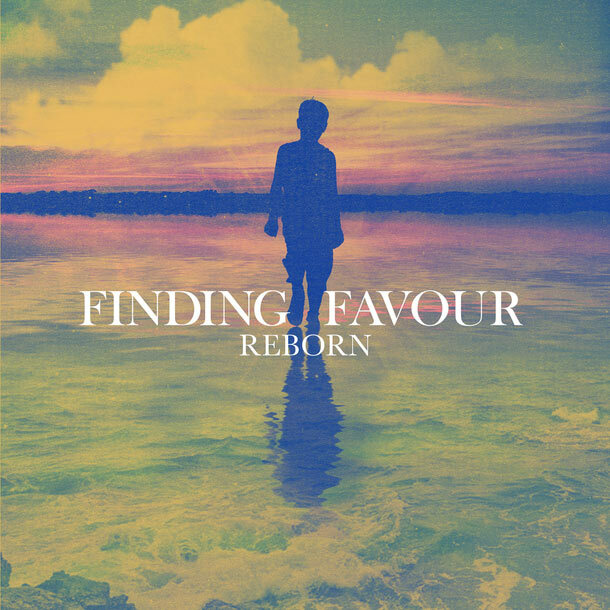 Nashville, Tenn. (April 07, 2015) ---- Gotee Record's Finding Favour, is scheduled to release their first full album, Reborn, June 23, 2015. Produced by Casey Brown (Love & the Outcome, All Things New), the new project shows the maturity and growth of Finding Favour since they first signed with Gotee Records in 2012. Reborn features 10 new songs that were co-written by the group, along with a reprise of their Top 25 National Christian Audience chart hit, "Say Amen." The first radio single from the album is the anthem ballad, "Cast My Cares," that is currently going for adds at AC and Hot AC/CHR radio, but receiving early airplay at KLJY-JoyFM/St. Louis, WVFJ- JoyFM/Atlanta, WCIE-JoyFM/Tampa, FL and PulseFM/South Bend, IN. For those fans who can't wait to hear the new record, pre-orders for Reborn will also begin today on iTunes (http://itun.es/us/t75v6). Every person who makes an early purchase of the album will receive three songs instantly from the project, "Refuge," the title track "Reborn," and "Cast My Cares." Those songs are also available today at all other digital outlets. Lyric videos for the songs "Refuge," and the title track can be viewed at www.findingfavour.com. Finding Favour fans are being treated to early performances of the new music as the band is featured on the current 42-city Newsboys We Believe God's Not Dead Tour that started in February and ends May 9, 2015. The band will unveil some of the new songs on an upcoming appearance for LeSea Broadcasting's Live From Studio B. For additional updates on Finding Favour please visit online, www.findingfavour.com, www.facebook.com/findingfavour, www.twitter.com/findingfavour, www.instagram.com/findingfavour. Finding Favour was formed in 2005 in Lyons, GA and consists of band members, Blake NeeSmith (vocals), Allen Dukes (guitar), Dustin Daniels (bass guitar) and Josh Duckworth (drums). The band signed with Gotee Records in 2012 and released their first studio EP, Finding Favour EP, in March 2013. The first two singles, "Slip On By" and "Shake The World" reached the Top 30 on Billboard's Christian Singles chart. "Slip On By" also became a Top 40 Country radio hit for country artist, Austin Webb. Finding Favour's single, "Say Amen," released in 2014 and reached Top 25 on Billboard's NCA chart. The group is poised to release their first full album, Reborn, June 23, 2015. The first single is "Cast My Cares" that has a radio add date of April 10. In 1992, a production team of three talented guys with diverse tastes shared a love for music. Producers Joey Elwood and Todd Collins, along with Grammy-winning artist TobyMac, launched Gotee Records in 1994 after unsuccessfully finding a label deal for the R&B trio, Out of Eden. With a steady focus on artistry, the new label expanded to reflect the diverse interests of its founders. Within 12 months, Christafari, GRITS, and Johnny Q. Public were signed, easily representing four different music categories; R&B, reggae, rap and rock. In the 20 years since Gotee's founding as a record label, it has launched the careers of Relient K, Jennifer Knapp, Sonicflood and more recently, Jamie Grace, Capital Kings, Finding Favour, Ryan Stevenson and Morgan Harper Nichols. The present day in the Gotee story is much like the label's early days. Through all the changes in a tumultuous music industry, the boutique label's independent spirit is maintained through a steady focus on artist development and diversity. For more info on Finding Favour visit the JFH Artists Database.